The mistakes in your editorial on County Road 106 are too numerous to address in 350 words, so I chose two points to discuss. Construction of a concrete sign in the right of way prompted the “stop work” order. The county granted a permit for this sign because CRMS’s Joe White wrote “yes” when asked if it was located on CRMS property. When applying for the permit, CRMS agreed to follow the county code, which dictates that “sign is located entirely on private property and shall not be located in a public right-of-way or easement.” By violating the rules, CRMS invalidated the permit. When asked by the county manager why he answered “yes” on the application, Joe White said it was because the right of way is CRMS property. This misconception is at the heart of CRMS’s refusal to compromise on CR 106. They still don’t grasp that this is public property. Where does the Post Independent get the impression that Satank’s concern is coming from a vocal minority? There are about 57 homes in Satank, and residents of 18 of those homes, or 32 percent, have spoken out against CRMS’s moves to exclude the public from the right of way. Most of those people have attended BOCC meetings during the work day. Imagine if 18,100 county residents, or 32 percent, took the time to attend an evening meeting, let alone a daytime BOCC meeting, to protest something. Would that be a vocal minority? The issue of County Road 106 is a microcosm of what’s going on in the country today; a private entity attempting to grab land by whatever means necessary, land that belongs to taxpaying county residents. I live in Satank, the neighborhood just north of the Colorado Rocky Mountain School, and my neighbors have encouraged me to take the high road through all of this. But I went to an all-girls Catholic high school, so while I’m comfortable on higher ground, I’m also familiar with the dirty, back-door politics that often seem to accompany private schooling. Also, I’m not afraid of the mean girls. If you listen to CRMS, you’d think we Satankers are a bunch of snaggle-tooth child-eating predators. Just to be clear, these Satank residents are people like Charlie Moore, Pat Menke and John Armstrong, two of whom are honorary CRMS alumni. When we snaggle-tooths got together recently to place the culvert in the middle of County Road 106 (our rightful property as taxpaying citizens) and I widened the trail to the south, it was to make it more easily accessible for Pat to maneuver his wheelchair across the ditch. Pat’s lived here a long time, and he was cruising down County Road 106 way before any of us even knew what a Koch brother was. I remember when CRMS had a great rapport with the community. Back in the days of Pat Fender, Judy Fox-Perry and Franz Froelicher; when the school matriculated such kind souls as Pat Bailey and Andrea Marsh. The school’s community involvement was genuine, and I’m told the administration of then would be horrified at the actions of the administration now. At one time, Shorty Pabst offered to donate his ranch in Old Snowmass to the school, and in hindsight that was the smart move. Located behind a small hill, surrounded by wilderness, that piece of property would have been ideal for securing the perimeter. However, we have to start from where we are; a porous campus that continues to be developed on and around a county road. Now, CRMS has started to build their grand new entrance sign in the middle of the public right of way. Even though the commissioners voted 2-1 not to vacate the road, we still have to take time off from our workdays and attend meeting after meeting because of CRMS shenanigans. If everything was on the up-and-up with their recent sign permit, why was the foundation built on Saturday and Sunday? Which is illegal according to Garfield County building regulations, because of the Lord’s day of rest. (OK, it doesn’t say that, but it is illegal.) A fact we could verify with the county attorney, if he hadn’t suddenly retired recently. I would also like to ask him if he thinks Tom Jankovsky should recuse himself because of his relationship with Larry Green, an attorney for CRMS and Sunlight Ski Area. Jankovsky works for Sunlight, and curiously, he is the only commissioner in this case who takes issue with the public wanting to access our own land. CRMS has latched onto the newest trick of the trade when it comes to land grabs; when all else fails, wait until you think no one’s watching and then take it. Copycat of the way the Koch twins are poised to take ownership of the western half of this country. They spent a lot of money on the last election to buy their legislators, and now they are trying to get federal lands transferred to state management. Easy-peasy, lemon-squeazy. States don’t have the resources to protect or preserve our public lands; they’ll have a bake sale for the kids and the next thing you know, we’ll all be kicked out of our favorite hunting, camping or hiking spots. They will “close the campus,” and eventually we’ll have as much public access to the land as they do east of the Mississippi, i.e., none. What a disastrous idea. I mean, really, we need Teddy Roosevelt to come back from the dead a lot more than we need Jesus right now. Who wrote this editorial about CRMS? Where is the byline? Sounds like it was written by someone from CRMS. Please get your facts straight. The neighbors were not on CRMS property when they replaced the old footbridge. That is our ditch lateral and it goes through the right-of-way, not CRMS property. CRMS made money when Dolores Way was built. They sold the property where Napa, etc. are now. ATVs cannot legally access the ROW. CRMS admitted to never trying to meet with neighbors, admitted they put an obstruction in the ROW and admitted that they don’t want the public to know about the ROW. All we are asking for are discreet signs that make it safer for everyone. Editor’s note: Editorials, labeled “Our View,” represent the opinion of the Post Independent as an institution, and are unsigned, common American journalistic practice. Unfortunately, the writer of the editorial on the CRMS right of way issues has not checked the facts. As the CRMS representative said in the recent hearing, the school is committed to preventing access to the campus. That explains all of their actions. This is not what was directed by the county commissioners. The issuance of permits for encroaching on the county right of way was a mistake by the county. No encroachment, especially a permanent encroachment, is allowed without a license. Applying for a license would have raised issues of a bond and/or of the requisite realignment of the county right of way. No survey has been done to show the actual area of the encroachment. The school’s attorneys would have known this. In essence, the school “pulled a fast one.” The school has also appeared to have previously encroached by placing a berm on the north end of the right-of way. The issue of safety is a red herring. The school tragedies of recent years involve perpetrators that have connections to the schools. The infrequent bike rider offers no plausible threat. Many preparatory schools have public streets crossing their campuses. No traffic accidents have been cited at the entrance to CRMS. The county did not call for the change to the entrance for any reason. Members of the Rockford ditch installed a pipe to replace an old, narrow and dangerous, expanded steel grate cage that had been used as bridge. This work was done shortly after the annual ditch meeting where the Satank shareholders of the ditch were told that they alone had full responsibility for maintenance of their ditches. This work, lasting less than four hours, was done in the ditch easement and in the ROW easement. There is no encroachment or impairment of the right of way or the ditch. This long overdue improvement was actually a safety improvement and an improvement to the trail. The commissioners had asked CRMS to meet with the neighbors. They did not. 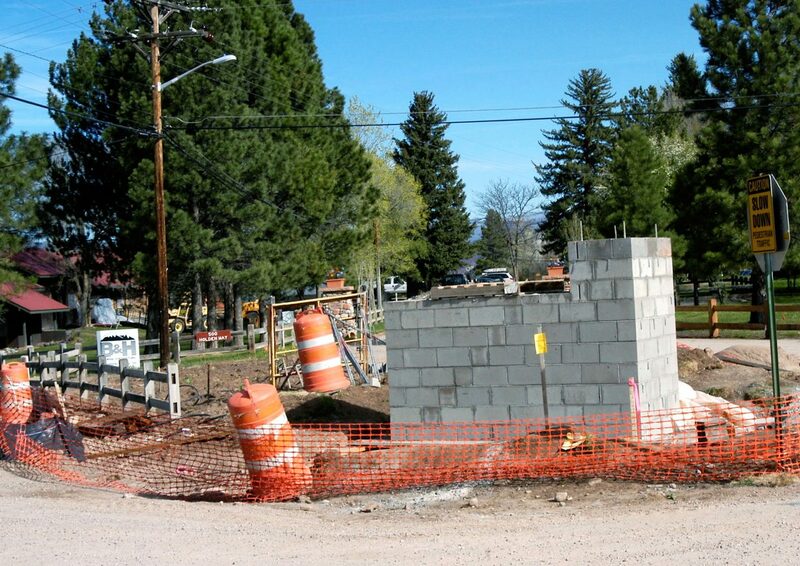 Instead, the recent construction work came out of the blue for both the neighbors and the county commissioners. The commissioners and the neighbors have asked for a clearly defined and useful trail across the campus on the right of way. The community of Carbondale stands completely open and supportive to the school and their students; are we really asking too much in return?